Club Penguin Cheats by Mimo777 Club Penguin Cheats by Mimo777: Club Penguin New Mission 11 You Decide! It's about time we get some news about the next Club Penguin Mission! So, CLICK HERE to vote on which glasses we can earn in the next Mission! Also, it looks like Club Penguin is working on a new Famous penguin to help with Club Penguin Missions! This could actually be Dot the Disguise Gal from Elite Penguin Force the Club Penguin DS Game for Nintendo DS. Dot is the guide that helps you through the Elite Penguin Force game. So it makes sense that she will be helping out in the Club Penguin Missions too! COOL! 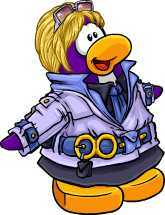 So does that mean this new Famous Penguin will be in Mission 11? Probably. Could be. Maybe. ;-] Thanks, Stickers303. i like 2 also. Could this new penguin possibly be the director of the PSA? i li9ke 2 also. Could This new penguin possibly be the director of the PSA? No I Do Not Think So Because There Is Only ONE director. WHOO-HOO!!!!!!!!!!!!!!!!!!! NEW MISSION YAY!!!!!! I think the third one looks best. Ooh new character??? sweet it would b cool if someone got penguin-napped and we had to go rescue him/her. P.P.S. does anyone know how to keep a cat off the table?? I just got a cat a couple weeks ago and she's decided that she wants to sleep and eat off the table. I can keep her off during the day but then she gets back on at night (just found that out). I would put her in a room and shut the door but I cant cuz her litter box is in a room with no doors and the rooms that do have doors r our bedrooms and the bathrooms and my mom doesnt want it in there. Any advice anyone??? plz???? Yea I was thinking it was Dot! I dont think her name will be 'Dot' on CP tho coz it is too short! Ok, so in the last mission Herbert left behind a packet of seeds! What could this mean? Could he be making poisoness vegetables and when we eat them we die? Sorry I cant go to your party! Later CPG you rule, CYA next weekend! wow...after one year the mussion is finaly going to come out!! !And they changed alot of things in SecretBuilders!!! It DOES look a lot like Dot. I'm surprised that their taking stuff from the DS game and using it online. Yes! I was waiting so long for next mission! Yay! shes not new. shes dot from the ds! I hope it is not #2 because it looks like that could be the Green Sunglasses. And, it can't be Dot, unless they used the full name because the beta tester dot already owns the name. Does anyone know what color the glasses will be? ps. mimo777 rocks. Well not possible. If you have elite penguin force the video game the director talks to you and DOT is right next to you. Nope. Director of the PSA won't show his identity. sorry! He wouldn't come. probably Dot like Mimo said. Mimo, Have You Notised If You Wear The Santa Beard Into Card Jitsu Fire, Sensi Will Say somthing differant? im happy about the new mission, its gonna rock! I dunno what color glasses it will be, but I'm thinking Aqua! LOL Mimo i think it is Dot! The Director of PSA doesn't have any indentification. It probably would be Dot. That used to happen to me 3 years ago accept I have a puppy! Try putting the litter box next to your door because my puppy used to do this all the time downstairs, so I put him by my door. Hope this helped! cool glasses! i voted for #2. todays the big webo party! soo excited! btw, snowcone is coming on tootsville at 8pm today and hes going to ask questions! if your wondering why i know this its because my freind and i were calling for him and he came! but he only was there for about 10 minutes and he told us. I totaly agree! That sooo looks like Dot! And it dose make sence because they already have jet pack guy and Director in the last mission. could be! or something close to that. Probably! But in the DS game, you are a different kind of agent...classified and secret, can't tell you! But, she looks a little like a character who is one of the very few in charge of your little agent gang in the game! Could it be her? Yeah! Are you talking about Dot in the DS game? That's what I was thinking! That's exactly what I was thinking! I'm surprised, too! That's what I think, too! Hmm, good point! But it would still be cool if it were Dot! i also JUST got my DSi. It cool. I can play ds lite games on it! First off, what in the fried fish eggs is the EPF? And secondly I doubt that anybody would want mimo to lose fans. Dot could not be able to be the new director of the PSA because there is the one and only "Director", and the director does not give out an identity. I KNOW!! I have been waiting just as long as you for a new mission And I am definitely voting for #2! When are going to post the party pics, Mimo? Okay this may sound stupid but put something over the table. I have a dog and she always jumped on the couch at night. We had to put boxes on the couch. Put something uncomfortable on the table for your cat. Like boxes or uhhh whatever you have in the house. I dont think you can train ats so be creative. Actually, I have a cat and she loves to sleep in our rooms with us, after they get used to living there of course. so umm... let her/Him sleep in your rooms and if Cats need to go to the bathroom they will just get up and go so she'll do that and come back to your Bed. Glad to help! Kats Rulez! Does anyone know what colors the glasses might be? If you are modding you should put (CPG mod) after you name like this. Seems like some letters got cut off. But Mimo already posted about the new sleds to go sledding down the mountain right? Or you mean the catolog which he already did too. Scroll down. Cool! That would be super cool! Mimo posted about 'em a few days ago. If you scroll down a few post, you'll see them. No, there is already one director and will stay one. He/she never has shown her identity so yeah. Lol, awesome, zebra printed! Definitly my style! I think there's a secret room to go along with this. thats what the blank screen is for. Ps I have a 2 cats also and it works!!! I am positive its not the director. The director is a guy. It could be Dot. That totaly is Dot and I can already tell that this is gunna be the best mission ever! I AM SO INSANELY EXITED!!! I thought the same thing. I read your message after i posted a comment. Wow we think alike. I think it is Dot because she is not in club penguin yet . That always happens to me! I think the new agent is dot from DS!!! For ur cat problem maybe u should put something she doesnt like on the table thats what i did with my dog and it worked. Ur friend Metalp10 CPG MOD in training. Nah, i dont think so. That is what has been happening to me too! WE should report this problem. Log in and log back on. If it is still not working, please contact Club Penguin Support. ~~~~~~~~~~~~~~~~~~~~~~~~~~~~~~~~~~~ The EPF is in the cp video game. it is an elite secret agancy that handles more dangerous and secret missions the PSA cant handle. UR friend Metalp10 CPG MOD in training! No, nobody knows the color. Maybe we could find a cheat or something to find the colors. Good thinking! Knowing Cp, it will probably be for Members only. Here is what i think of those Glasses. #1: Makes your eyes look big. #2: Looks cool like Special Ops Master glasses. #3: look like gary's and i kinda weird looking. I am watching NFL football. I like the San Francisco 49ers. What team do you like?? I dont think that Club Penguin will kill penguins. But the seeds are a big clue. Maybe they will grow stuff and it will over grow. Then it will cover all CP! Oh yeah! 2 ROX!!!! nd the mission, what could be cooler than that? I like #2! It rocks like Zebras! do all penguins get to get the glasses? cuz i really need some glasses. I think so if it's not for members only this time! I like soccer! but I do watch a little bit of NFL! I like the Minnesota Vikings. I think so. After all, no one said non-members couldn't! And, anyone can do missions, right? Gotta be a yes! Go Steelers! (I know, the suk this year, but they hold the record for most super bowl wins, ha!) Everyone teases my fam., we're all Steelrs fans; everyone likes the Bengals where I live! (No, I don't live in Cincinatti, but somewhere in the range of there...) Well, you know what? Boo-dey! Yeah, that's right, I disgraced their catch-phrase or whatever you call it! Here's my idea. You do something special, something you don't have to do to win, and you get the glasses as a reward, plus the award. I think number 2 looks too much like the ski goggles, and number 1 looks like the PSA glasses. Thats why I picked number 3. But two is gonna win. everybody vote #2! it looks kinda retro and all future...y. it looks kinda like x-ray. VOTE #2! oh ya and plz post. alot of my comments havent been posted in a long time. i dont blame you. Yeah I guess since they're part of the mission. hey cool! and u know what that means! A NEW DUDE WHO GIVE OUT BACKGROUNDS! any ideas on what it might be? So your the Steel Curtain person! But all i got to say is GO 49ers! *GASP* You are a 49ers person, too?! Black and gold are, like, awesome! (But purple is my fave color :P) Look, you can try to break the Steel Curtain all you wanna, but it isn't gonna work! You wanna go? Yeah, this girl ain't all sugar and spice! IS THAT DOT THE DISGISE GAL!!!!? It feels awesome with Dot around, she really helped me! (Although I already know CP) PS: She is really sweet, kind and smart! Prolly something in the Agent Hideout or in the EPF Hideout. Pretty cool! Hrm, I dont know about that, its a good idea but the directors face is never shown so it probably isnt. You should be that person not the penguin girl...seriously!! Hmm....I think they are going to be black on the outside and red or green on the inside? Maybe? i pick 2 but mimo i got on at 11.30 and the snow maze was still there and i got back on at 12.00 and it was gone! Clever! That would be cool! Great idea! I don't really like football, either, but I'm a Steelers girl :) But it's ok if people don't understand why you like NASCAR better, you can like wat you wanna like! I like the NEW ENGLAND PATRIOTS! Go Pats! Anyway Number 2 has one! !Woo hoo!! I don't think that that question should be asked Mimmo777s cheat site. Maybe you could find it on meoow777s cheat site (JK). is this mission gonna be for all agents or just EPF. and do you need to like update your game..? and how do you become a CPG mod. i want to ask if the mission is only for members? Since when have missions been for members only? But, the way CP ruined the experience with stamps, I see why you thought so. Clubpenguinwave,maybe Herbert is planning to poison the PSA.Anyway,I think the glassesare Number 2. Polkadotblu9,One:EPF stands for Elite Penguin Force Two:The EPF is a group that does more difficult stuff then the PSA.The EPF is mentioned in both vidio games.